June M. Kearsing, 82, of Silver Springs, Fla., passed away on Tuesday, April 9, 2019 at The Ted & Diane Brandley House in Marion County, Florida. Born in Albany on June 12, 1936, June was the daughter of the late Kenneth Kannaley and Helen (Halpin) and step daughter of Kate Kannaley. She was the devoted wife to the late William Kearsing whom she married on March 12, 1983. They shared 15 years together until his passing in 1998. Born and raised in Albany, June was a resident of the area for most of her life until she and her husband retired to Summerfield, Fla.
She resided for the remainder of her life in Silver Springs, Fla. after her husband's death. June was of the Catholic faith and a communicant of St. Joseph of the Forest Church in Silver Springs, Fla.
For many years June was a sales clerk for Rosen's Department Store in Albany. She was a member of American Legion Zaloga Post in Albany. June was also a proud and avid NASCAR fan who enjoyed attending many races at the Daytona 500. 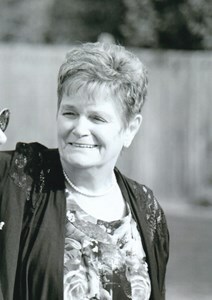 She enjoyed spending time with her children and grandchildren as well as her beloved cat Molly. June is survived by her children; Patricia Nolan (Kevin W.), Linda Giulianelli (Nick), Thomas Nolan (Holly), Kevin Nolan, her stepchildren; Bill Kearsing (Lori), Sandra Farmer (Bob), Karen Warburton (Robbie) and John Kearsing (Theresa), her siblings; Patricia Macken (John) and Kenneth Kannaley. She was the grandmother of 11 Grandchildren, 19 Great-grandchildren and 1 great-great grandchild. Several nieces and nephews also survive. Besides her parents and her husband, June was predeceased by her son, Billy Caul. Relatives and friends may call 4-7 p.m. Tuesday April 16th at New Comer Cremations & Funerals, 343 New Karner Road, Colonie. The Mass of Christian Burial will be celebrated at 9 a.m. Wednesday April 17, 2019 at Blessed Sacrament Church, 607 Central Ave, Albany, NY 12206. Interment will follow the Mass in Memory Gardens, Colonie. In lieu of flowers, the family requests that donations be made to the Ted & Diane Brandley House in Marion County, Florida located at 17395 SE 109th Terrace Rd., Summerfield, FL 34491 or The National Kidney Foundation, 30 East 33rd Street, New York, NY 10016 in memory of June M. Kearsing. Add your memories to the guest book of June Kearsing. Thank you for being the most loving grandmother to all of us. You’ve taught us all so many life lessons. How to love, how to be loved, and how to cherish the time with family because it’s the most important thing. I am so blessed to have had a grandmother so full of life like you. You had the most contagious laugh and a smile that lit up the room. Thank you for being my confirmation sponsor and being at every event possible. I miss you more than you’ll ever know. This isn’t goodbye, but an I’ll see you later. Rest in paradise my angel. God gained a good one this time. WE HAD SOME WONDERFUL TIMES TOGETHER AND I MISS YOU.